Effective verbal communication is probably the one skill that can make you shine like a superstar in a few minutes. Brilliant speeches, sales pitches, and conversations only take moments to deliver, but live on long after they are over. So it's safe to say, developing solid public speaking skills is not only important for business, but for life in general. Now, I can't claim to be the world's greatest public speaker, but I've had my fair share of chances to spread my message. 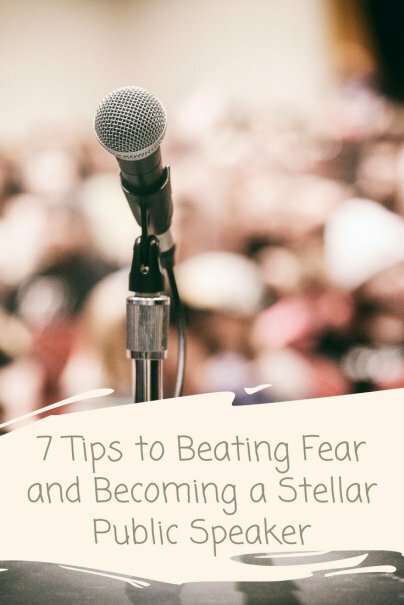 And as the audiences have grown larger and the speeches longer, I've figured out a few things about the fear and nervousness that often accompany public speaking. Here are seven tips to keep in mind when preparing for and delivering a presentation. Life is too short to spend time acting like someone else. Maybe you're not the perfect package. That's fine. Who is? Imperfection is part of being human. People respect someone who is humble enough to be themselves. This strategy is especially true if you're asked to talk about or promote something that you are morally or ethically uncomfortable with. In the end, all you have is your integrity. It's not worth sacrificing that for one speech. In the words of Shakespeare, "This above all: to thine own self be true." Ask almost anyone and they will tell you that a short and clear speech is always better than a long one. Say your piece, make your point, and move on. Speaking at an event and worried you won't fill your time slot? Don't be. There was never a conference attendee was disappointed that the conference ran ahead of schedule. If you have no idea what you're going to talk about, then it's always a good idea to tell a story. In fact, even if you do know what you're going to talk about, it's a good idea to tell a story. Stories are memorable. People might not recall your main points an hour later, but they will recall – and retell – a good story for years afterward. Stories are meant to be told, not memorized. You don't have to worry about messing up a word or not remembering every sentence. The nature of stories is to keep things natural and tell them in a conversational style. People associate their own meaning with stories. This means you can tell one story and it might touch each person in the audience in a different way. This is powerful because everyone might not agree with a bullet list of points on a slide, most people can find something they enjoy in a decent story. Don't speak about things you don't enjoy. It sounds simple, but why would you want to spend your time promoting ideas you don't believe in? This means you might have to say "no" every now and then. Saying "no" to a speech that you're not a good fit for is just as important as saying "yes" to the perfect opportunity. Put yourself in a position to succeed by focusing your efforts on events and venues that match your skills and passions. Last year, I was getting ready to step on stage at a conference in Switzerland and deliver a keynote to almost 1,000 business leaders. Before I walked out, a friend looked at me and said, "Remember, they want you to succeed." And he was right. Who doesn't want to hear a great speech? Who wouldn't want to hear a story they will remember for years? Who wouldn't want to discover a product, service, or idea that changes their life or business? The people you are talking to – whether they are business partners, potential clients, or total strangers – are looking for someone to cheer on. They want you to be the best thing that happens to them all day. All you need to do is put yourself out there. The audience is waiting to support you. Sometimes you just need to take a deep breath and step back for a moment. If you're being honest with yourself, you'll realize how insignificant your fear really is. What if I had totally bombed that speech in Switzerland? What if I was booed of stage? Honestly, I'm not sure that much would have changed. I would have been bummed out for a day or two. Later I would have learned something from it. And later still, I might have turned it into a good story to tell in a speech about what not to say during a speech. One reason we fear public speaking is because we are often seeking approval during a speech. We want our accomplishments to be noted and appreciated. We want our efforts to be justified. There is nothing wrong with that ... but we also need to remember to keep other people's opinions in the right place. While you don't need to take a me-versus-the-world approach, it is important to have enough courage to stand by your work and push criticism aside. Prepare the best speech you can and deliver it. If the audience hates it, they hate it. There's always another speech to give. Beating yourself up over imagined or hypothetical criticism won't help us give it.